Discussion in 'AirPlay' started by sailorman, Jul 7, 2011. I use airplay often with my Apple TV for the TV. That is all fine and I love it! But I also have a great component stereo system that I would love to send my iPad music to. Does anyone know of device like the Apple TV but made for audio system inputs? Do you need to do this 'wireless'? 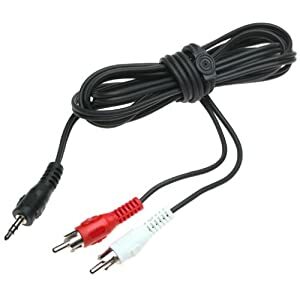 I have an iPod Touch which has all of my music (so have not loaded up the iPad2 w/ the same files) - I just use a 'wired' connection to an AUX input on my stereo receiver w/ a cable like the one shown below; just plugs into the iPod - iPad would work the same; of course you'll need to leave the iPad close to your stereo, but w/ playlists, I have hours of music that will play - but please let us know your solution(s) - good luck! Yeah that's a good point! Get an iPad dock and plug it in to the stereo then get tango music player (if you have an iPhone) then you can control it with that! Poser I think you have found what I was looking for. I have exact same set up with Apple tv and surround system. 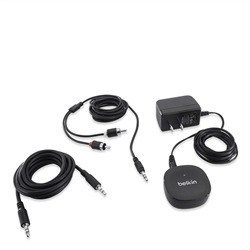 Depending on type of surround system you can run a TOS optical audio cable from Tv to sound system They cost about $30 to purchase This way not only your music is streamed but also your tv sound. Now, I've had a pair of Sennheiser 'wireless' headphones for a number of years to listen to my stereo - never been happy w/ this set - just a lot of interference from the airwaves. So, is this BT technology any better - just wondering? I used something called Scala rider G4(Bluetooth), for my motorcycle helmet, that includes 2 stereo speakers (really flat) that fit inside the helmet, Velcro inside near ears, awesome sound(not weak), also it's voice activated, so I say "yo,or whatever", it answers my phone calls. To answer your question, I also used it to play music via Bluetooth from my iphone, no signal issues, none. but it does not work with every stereo and that sux.